Former Russian senator sentenced to 7 years in prison for $17.4 mln embezzlement | Russian Legal Information Agency (RAPSI). 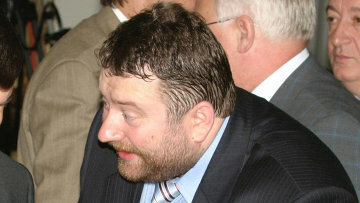 MOSCOW, February 27 (RAPSI) – Moscow’ s Lefortovsky District Court on Monday sentenced ex-federal senator for the Belgorod Region, Sergey Popelnyukhov, to 7 years in prison for embezzling over 1 billion rubles ($17.4 million) allocated for construction of Kalashnikov assault rifles manufacturing plants in Venezuela, RAPSI reports from the courtroom. Moreover, the court granted a claim filed by Rosoboronexport arms trade company demanding to collect 1.14 billion rubles from Popelnyukhov. It was found that the defendant had worked out a criminal plan for stealing money. Prosecutors earlier demanded an 8-year prison sentence and a 1-million ruble fine for Popelnyukhov. According to the Prosecutor General’s Office, Popelnyukhov embezzled 1.1 billion rubles ($17.4 million) which his company “Stroyinvestengineering Su-848” had received from Venezuela for building plants for production of Kalashnikov assault rifles and auxiliary ammunition. The deal was made as a part of contract with Rosoboronexport arms trade company. Constructors involved in the construction of industrial facilities reported long-time delays of salary payments. This situation attracted attention of the Federal Security Service’s (FSB) department responsible for security at industrial objects. Deadlines for putting facilities into use were postponed repeatedly until the end of 2015. The defendant's defense earlier claimed that plants were not built because of inflation in Venezuela. 17:17 27/02/2017 Moscow’ s Lefortovsky District Court on Monday sentenced ex-federal senator for the Belgorod Region, Sergey Popelnyukhov, to 7 years in prison for embezzling over 1 billion rubles ($17.4 million) allocated for construction of Kalashnikov assault rifles manufacturing plants in Venezuela.